Lumeria Maui Continues to Draw Leading International Organizations and Non-profits, Recently Hosts MaiTai Global and Wounded Warrior Project Wellness Retreats. International organizations and non-profits are finding Lumeria Maui's programming - daily yoga and meditation offerings, serene spaces and settings, farm-to-table dining and engagement with teachers and healers of the holistic arts - to add invaluable experiences for meetings, events and retreats. Amazing that one establishment could provide an environment conducive to a broad range of human activities ranging from intensive networking, to creation, and self-reflection all in one place. Lumeria Maui, Hawaii’s leading holistic, educational and wellbeing retreat located at the gateway to upcountry Maui, is gaining national and international traction as an ideal destination for hosting events, meetings and wellness escapes for business and non-profit organizations alike. Lumeria’s vast offering of courses and activities geared towards wellness and personal growth such as yoga, meditation, horticulture and more, the retreat’s nutritious farm-to-table dining options and its ability to engage master holistic teachers and healers have been identified by organizational leaders as welcome accompaniments that enhance their goals and objectives. Most recently, Lumeria Maui hosted MaiTai Global, a network of extraordinary entrepreneurs, innovators and water athletes dedicated to philanthropic efforts protecting the world’s oceans, and the Wounded Warrior Project, a U.S.-based veterans’ charity service focused on the aid and assistance of injured service men and women. MaiTai Global has three years in a row selected Lumeria Maui as host for its annual and flagship event, which has become a major destination for entrepreneurs seeking to fund new endeavors with successful tech icons, many from Silicon Valley and around the globe. Though approaching their respective events with different goals, both MaiTai Global and the Wounded Warrior Project utilized Lumeria’s incomparable wellness offerings including daily yoga and meditation, healthy meals, serene outdoor settings for meetings and educational sessions, and authentic Hawaiian cultural experiences such as a Ho’oponopono ceremony (a ritual in reconciliation and forgiveness), holistic healing sessions and performances conducted by local healers, educators and artists. Growing its global network of holistic masters and expanding its interaction with the local community, Lumeria Maui continues to offer unique educational experiences in holistic and spiritual wellness and Hawaiian culture to visitors. Nainoa Thompson of the Polynesian Voyage Society delivering a keynote speech to MaiTai event attendees and Hawaiian elder while Hawaiian elder Kahu Lyons Naone imparted wisdom to the veterans attending the Wounded Warrior Project retreat. Leaders such as Thompson and Naone exemplify Lumeria’s ability to connect its visitors to relevant teachers while celebrating age-old Hawaiian tradition. Other recognizable organizations to host events and retreats at Lumeria Maui since its opening include Lululemon, CNN, and TedX Maui. Lumeria also frequently hosts Hawaiian cultural groups and non-profits including the Hawaiian Islands Land Trust, Kamehameha Schools, the Pa’ia Youth and Cultural Center and the Maui Cultural Lands. That Lumeria Maui is continuing to engage local, national and global organizations alike speaks to its versatility as not just a leading Hawaiian retreat, but a leading retreat at the epicenter of personal growth and wellness education having global appeal. Lumeria Maui is a destination that exists to nurture, support, and inspire individuals and groups to discover and honor the creativity that resides within each of us. We provide a sanctuary of peace and tranquility surrounded by natural tropical beauty to calibrate the mind, restore the body, and nourish the soul. 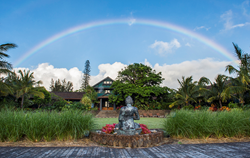 Lumeria’s historic facilities have been thoughtfully restored and offer a beautiful setting for self-exploration, healing, and learning set atop Maui’s North Shore. From the farm-to-table menus and classes at the Café at Lumeria, to the healing treatments and therapies offered through the Wellbeing Center, the educational, cultural, and spiritual practices of Maui are embedded holistically into each visitor’s experience. We offer classes, workshops, retreats, and immersions in health and wellbeing, yoga and meditation, nutrition, food systems, culinary arts, detox and cleansing, personal growth, music, fitness, Hawaiian heritage, nature and adventure. The transformative experiences in our classes and programs provide opportunities to work with world-class retreat leaders, facilitators, and healers while experiencing the beauty of Hawaiian tradition. We are honored to share the rich heritage and unspoiled nature of upcountry Maui and invite you to connect with the natural beauty of the island: the Mana (life energy) and ‘Aina (land) and the Kama’aina (people). We welcome you to our ‘Ohana (family).